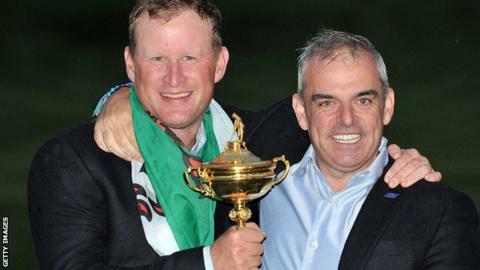 Wales' Jamie Donaldson reflected on his "remarkable journey" after securing the winning point on his Ryder Cup debut. The 38-year-old was playing on the second-tier Challenge Tour in 2007 and did not win his first European Tour title until 2012. Donaldson's superb wedge shot on the 15th clinched a 4&3 win over Keegan Bradley to give Europe the 14½ points needed to beat USA at Gleneagles. "For it to finish a foot from the hole, it's obviously quite a bonus," he said. "It was quite a way to finish." "It's been a remarkable sort of journey for me over the last couple of years." Donaldson picked up three points from a possible four, claiming two foursomes matches alongside Lee Westwood, by contrast playing in his ninth Ryder Cup. The Pontypridd-born player qualified for the European team by winning the Czech Open on 24 August - the penultimate qualifying tournament. And Donaldson revealed the pressure was on him after European captain Paul McGinley told him he would favour experienced players as his wildcard selections. "I spoke to Paul before the team was selected," said Donaldson. "I had just had two weeks in America playing the Bridgestone and US PGA and hopefully securing my place there, and I didn't." In fact, a missed putt on the 18th hole at Valhalla left him 20,000 Euros short of qualification with just two qualifying events remaining. "I spoke to Paul on the phone," added Donaldson. "In this amphitheatre here around this 15th green and to hit a shot in like that from the middle of the fairway with the whole world watching, and Tom Watson on the fairway there, and he hit it in to - what - a foot, 14 inches - wow! Brilliant! I'm so happy for him, he's been brilliant. But I think a lot of credit for Jamie this week goes down to Lee Westwood, he's done an incredible job with him." "And he said, 'Listen, you're going to have to go to the Czech Masters and you're going to have to go to Italy or just one of the two to make enough money to qualify for the team, because the picks usually go to experienced players'. "I went to the Czech Masters and played really well and did enough there to secure my place on the team. "So yeah, it's a pretty incredible experience for me to get on the team and then be part of a winning team, as well. It's been an amazing few weeks." Donaldson's emergence after winning the Irish Open in 2012 is in contrast to the early part of his career when he struggled with a chronic back problem. He was even told in 2004 by one doctor to quit the game. His perseverance paid off at Gleneagles when, with Europe needing a point to clinch the trophy, the focus of the golfing world fell on his match with Bradley. Donaldson initially made sure Europe would retain the trophy by guaranteeing half a point against Bradley by holding a four-hole lead with four to play. But he then sealed outright victory in style, hitting his approach to the 15th to within inches of the hole and prompting the captains to shake hands before he had reached the green. "I hit a really good tee shot down 15 and I had 140 yards to the hole which is a perfect wedge for me," Donaldson added. "Sometimes you can hit a really good tee shot and not have a good yardage and you've got to make something up. But it was a perfect number for a wedge with it being downwind. "So all I had to do was get it on line and it was going to be the right club. For it to finish a foot from the hole, it's obviously quite a bonus.